Artist Fanny Allié's sculpture is a bench shaped like the outline of a sleeping person. LONG ISLAND CITY — A wooden bench in the shape of a sleeping person was installed in front of MoMA PS1 — an art work that's meant to be a reminder of the city's homelessness issue, the artist says. Brooklyn artist Fanny Allié designed "A Bench for the Night" as both a place to sit and to draw attention to those without a permanent place to live — "a reminder that a public bench is a potential bed for some New Yorkers," according to statement from the Parks Department. The piece went up last week on Jackson Avenue and 46th Street, in the NYC Parks Greenstreet in front of MoMA PS1. The bench is made of wood, and its seat and back are shaped like the silhouette of a reclining figure. "People could sit on it, even lie down, interact," Allié said. The same site was recently home to another work of art, an antique phone booth where passersby were asked to record their thoughts on public art. Both installations are part of the Parks Department's Art in the Parks program. Allié is no stranger to making art that appeals to social justice. 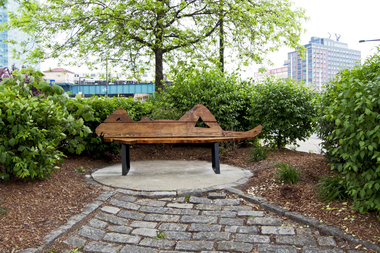 "A Bench for the Night" is intended to be a continuation to a similar piece she created called "The Glowing Homeless" — a neon form of a person sleeping on a park bench that was on display in Greenpoint in 2011. Another of her works, "Serendipity" was in Tompkins Square Park in 2013 and was a life-sized steel outline of a man, modeled after a formerly homeless man who used to frequent the park. "A Bench for the Night" will be on display until Nov. 15, according to the Parks Department.